Pepperplate is a great website and app which allows you to import and manually insert recipes, plan meals and create shopping lists. 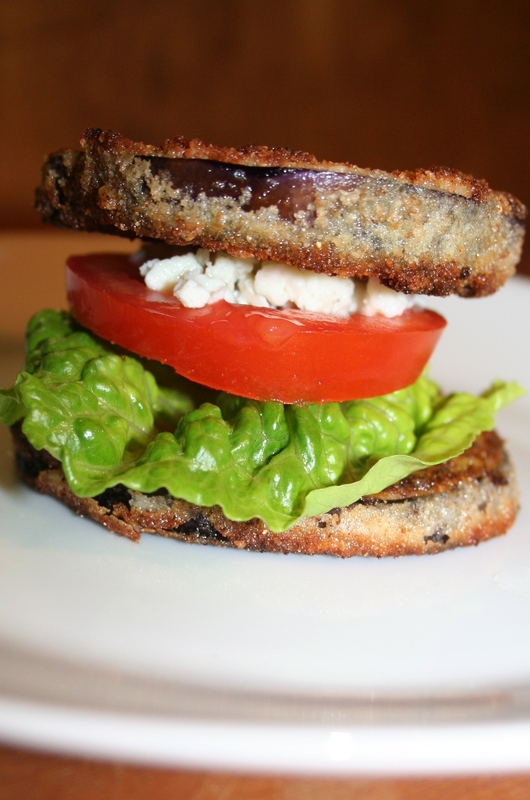 One easy and tasty recipe I recently imported and tried is Matt Romero’s Eggplant “Sandwiches”. The original recipe called for panko bread crumbs, canola oil, basil, and goat cheese. However, I used some different ingredients as well as added some different toppings. Using all the ingredients below, I dipped the sandwich in taziki yogurt dressing (from Target). Using all the ingredients below except the gorgonzola cheese, I added chicken salad I made previously (canned chicken [drained], mayonnaise, chopped pecans, sliced grapes, canned pineapple [drained and cut into bite-sized pieces]). Place the flour, eggs, and bread crumbs in separate shallow bowls. Dip the eggplant slices in the flour, then in the eggs (letting any excess drip off), and finally in the bread crumbs. Heat oil in a large non-stick skillet over medium-high heat. 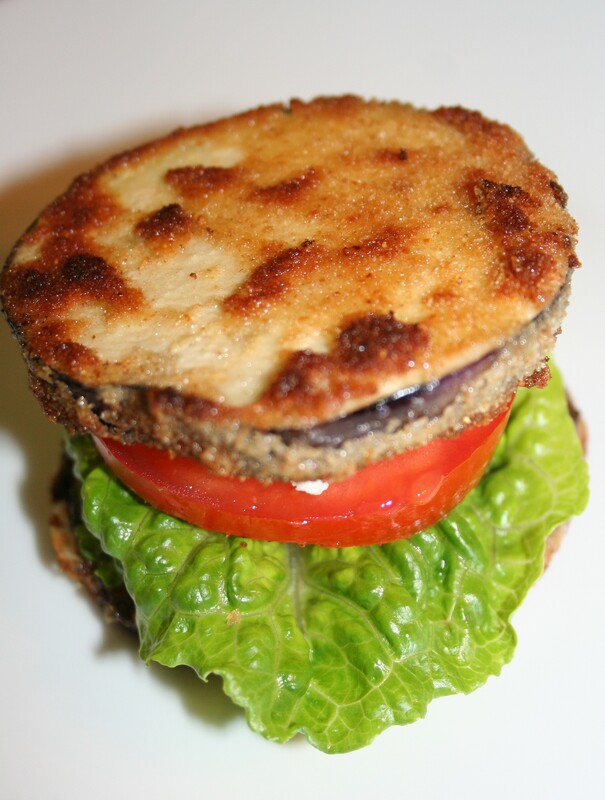 Cook eggplant until golden brown and crisp, 2 to 3 minutes per side; transfer to a paper towel–lined plate. Wipe out the skillet and repeat with the remaining oil and eggplant. Sprinkle the hot eggplant with ½ teaspoon salt. Layer the eggplant, lettuce, tomatoes, gorgonzola cheese to form 4 “sandwiches,” with the eggplant on the top and bottom of each stack.